Youth, Food, and Agriculture Through our Catskill Edible Garden Project (CEGP), we have partnered with local schools to create fruit and vegetable gardens; improving student access to healthy, local foods. By growing their own food, students built confidence and self-esteem while learning life lessons about good nutrition and career options in agricultural or food-related businesses. Just finishing its second season, the project has engaged hundreds of community members on garden build days at seven gardens across Sullivan County. Garden clubs have been set up, and teachers are integrating important lessons about food production, healthy eating and the importance of local food systems into the classroom. Some schools have even been serving student-grown garden produce in their cafeterias. The workforce development component of the project has employed 12 local youths in summer work, giving area students the chance to learn how to grow, harvest, process, and prepare garden produce, which they distributed to local families and food pantries. CEGP is a partnership between Catskill Mountainkeeper, Sullivan Renaissance, and other local organizations. You can learn more about the project and see additional photos here. Food Access In October, Mountainkeeper wrapped up its first full season managing a new Catskills farmers’ market, located in the Sullivan County capitol of Monticello. The market improved access to healthy food for low-income residents and others, by connecting them with farmers and artisan food makers from our region. While it's the hub of an agricultural county, Monticello is a USDA designated ‘food desert’ – meaning a community without ready access to fresh, healthy, and affordable food – and its residents suffer some of the worst health statistics in the state. Working with area partners, Mountainkeeper opened the only market in the county to be approved by the Farmers' Market Nutrition Program. Participating farmers were certified by the program, meaning they could accept vouchers provided to low income families and seniors under federal programs like the WIC Farmers' Market Nutrition Program, which provides aid to women, infants and children. In addition to making fresh, healthy produce available, many of the markets offered recipe tastings and demos using local and seasonal produce, and provided information about health and nutrition. As a result of the market, we saw a significant increase in voucher redemptions for fresh fruits and vegetables. Next year, we plan to expand this popular program to build on this year's success. To get involved, please click here. 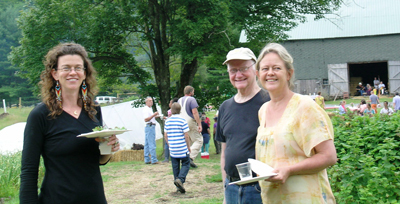 This summer, more than 300 patrons attended our second annual farm-to-table supper at beautiful Neversink Farm. We were thrilled to welcome back James Beard Award-winning chef, Patrick Connolly, who prepared another delicious feast with thoughtfully-sourced ingredients from some of the Catskills' finest farms and food producers. By committing to purchase locally grown and processed foods, we allow farmers and producers to receive a higher profit margin, as they are able to eliminate many of the transportation and distribution costs associated with more geographically distant sales. Enabling local sales and food distribution allows farmers to develop relationships within their communities – whether that be with individual customers or local restaurant/business owners. For more information on this and other on-farm events, please click here. To learn more about other Catskill Food Initiative programs, partnerships and resources, and ways to get involved, click here.